September 1, 2013 @ 8:40 P.M.
DURHAM — Trooping from farm-to-farm in North Carolina and around the Midwest, employees from Durham-based AgBiome gathered samples of plant roots, leaves and soil from fields of crops such as soybeans and corn earlier this year. “It’s just like looking at the ocean, but it’s fields,” said Dan Tomso, chief scientific officer for AgBiome, describing the Midwestern scenery he saw on one road trip to collect samples at multiple farms each day in Indiana, Illinois and Ohio. The reason for the road trips? To build up a stockpile of samples where tiny microorganisms, such as strains of bacteria, might be living. With their collection, Tomso said company officials hope to identify individual microorganisms, or genes within them, that can be used to help agricultural crops to grow, or to control pests that harm crops. Ultimately, company officials plan to use their findings to either partner with larger firms to develop products that can be commercialized and sold to farmers, or to develop those products on their own. The agricultural biotechnology company is new, gearing up this year after closing on $14.5 million in startup financing. The team behind the new venture closed on the financing in December, Tomso said, after starting their fundraising effort in October. AgBiome announced the funding in April. The company is up to 15 employees now, Tomso said, and is expected to employ 25 by the end of the year. The company moved into office space in January in the Research Triangle Park at 104 T.W. Alexander Drive, Tomso said, and took occupancy of the lab space earlier this summer after renovations were completed to convert old classrooms into labs. They chose the location on because of cost reasons, Tomso said, and because there is room on the siteto build a new greenhouse. The company leases greenhouse space at the University of North Carolina at Chapel Hill. 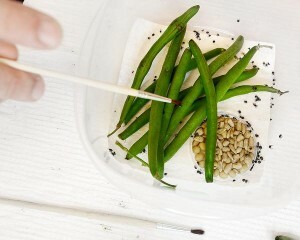 In their space, the company has several labs, such as one where they can test individual microbial strains to see what effect they might have on certain crop pests. Tomso said they also have a number of high-performance computer servers that they’re testing. Ultimately, they plan to use the equipment to analyze large quantities of information about the genetic blueprint, or DNA, of the micro-organisms they’ve collected. AgBiome is paying other companies to sequence the DNA, Tomso said, adding that a lot of progress has been made in sequencing technology that’s allowed the cost of that work to come down, and for the work to be done at a greater scale. said, such as how to analyze and understand all of the new data generated. 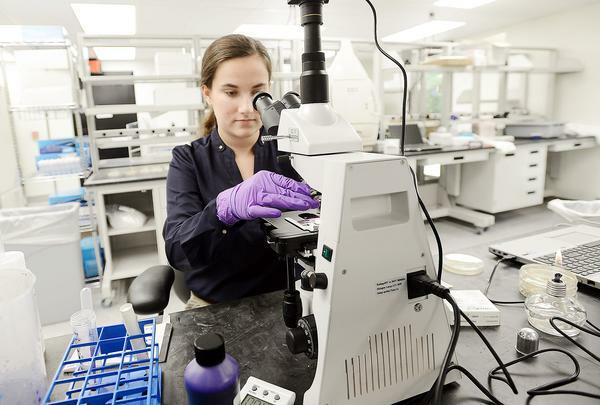 Jeff Dangl, one of AgBiome’s founders and a biology professor at UNC-Chapel Hill, said advancing DNA sequencing technology is a “huge driver” for the company. He said the “slow way” of trying to identify helpful microbes is to test them in the lab first. But he said you can’t easily do those types of tests for thousands of microbes. To date, the company has isolated more than 1,000 individual or bacteria or fungal strains from their collection samples of roots, soil, or leaves, Tomso said. The company is hoping to take that number of individual isolated microbes up to more than 10,000 in the first year, he said. He said the products they discover could be sold in the form of useful genes inserted into crops, which Tomso said the company would likely try to find a partner to produce, or in the form of biologicals, or beneficial organisms applied to plants. He said biologicals are an “up and coming segment” in the agricultural biotechnology industry, and the company could work on its own to produce those products, or partner to commercialize them. In the fourth quarter of this year, he said the company expects to be in the greenhouse doing commercial testing a potential product. The timing of the company’s launch was due to the right science and the right people coming together, Tomso said. His own background includes roles at Bayer CropScience, an agricultural biotech company that develops seeds and genetic traits to help farmers, and at Athenix Corp, which was acquired by Bayer CropScience. Other members of the leadership team have held roles at companies including Bayer CropScience and with the pharmaceutical company Novartis. “I think that the excitement about AgBiome, and our particular approach, can be reflected in how fast we’ve grown (and) the people that … (the company) has been able to recruit,” he said. COPYRIGHT © . AGBIOME, LLC. ALL RIGHTS RESERVED.